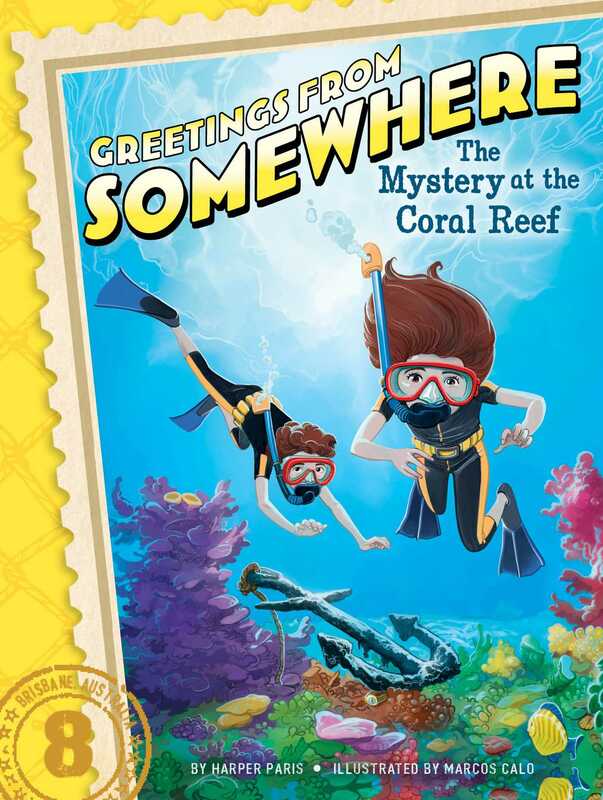 Ethan and Ella are on the trail of an Australian coral thief in the eighth book of Greetings from Somewhere, an exciting series about mystery, travel, and adventure. Ethan and Ella are in Australia, home to beautiful beaches and some of the most famous coral reefs in the world—plus tons of cool fish and other underwater creatures! And not only that, Australia is home to Ethan and Ella’s aunt, uncle, and cousin. The twins dive right into the water for some snorkeling at their cousin’s beach house, and while they’re exploring, they come across a watch that’s still ticking. Whose is it? Then they hear reports of fishermen illegally taking coral from the reefs nearby. Could Ethan and Ella be on the trail of a coral thief? The Mystery at the Coral Reef CHAPTER 1 Australia! “That girl’s going to fall off the bridge!” Ella Briar shouted. Her twin brother, Ethan, looked up. The Sydney Harbor Bridge gleamed against the bright blue sky. At the top of the massive bridge was a girl peering over the side. How did she get all the way up there? And then Ethan saw that there were other people with her. Lots of other people. “It’s okay, kids. You can actually climb to the top of the bridge,” their father, Andrew, explained. “The view is supposed to be great!” their mother, Josephine, added. “Wow!” Ella gazed out at the skyline of downtown Sydney and at the sailboats that dotted the harbor. The view from the top of the bridge probably was great. But she couldn’t imagine being up that high. She’d had enough of high places after Machu Picchu! Machu Picchu was an ancient Incan city in Peru that was thousands of feet in the air. The Briars had spent some time there before flying off to Australia. Australia was the seventh stop on their trip around the world. Mrs. Briar was a travel writer. She was writing about their adventures for their hometown newspaper, the Brookeston Times. The twins were excited to be in Australia. It was beautiful and warm, plus everyone spoke English, which meant that it was easy to communicate. Best of all, they were driving up the coast tomorrow to visit their aunt Julia, their uncle Owen, and their cousin Harry. “Who’s hungry for some Balmain bugs?” Mr. Briar called out. “Bugs?” Ethan and Ella gasped in horror. “And after lunch, we’ll go there.” Mrs. Briar pointed to a white building that jutted out into the bay. “It’s the Sydney Opera House. We’ll do a backstage tour and then stay for the opera,” replied Mrs. Briar. “What about the aquarium?” asked Ella. “Hannah’s family went there last summer. She said it was awesome!” Hannah was Ella’s best friend back in Brookeston. “I wish we could fit that in. But we won’t have time today. And we’re leaving Sydney first thing tomorrow morning,” said Mrs. Briar. Ella pouted. Ethan was disappointed, too. He had really wanted to experience some real live sea creatures while they were in Australia! Hopefully there would be another chance for that.